A division of the Unique Maritime Group (UMG) which is one of the world’s leading integrated turnkey subsea and offshore solutions providers,Unique Seaflex is proud to have assisted world-renowned Belfast shipyard Harland and Wolff with the largest load test ever carried out with the use of their WaterLoad™ range of bags over the course of the final days of May 2014. Building on 150 years of marine manufacturing experience, Harland and Wolff offers a unique combination of vast facilities and technical capability. From initial consultancy through detailed engineering, fabrication and through-life support, Harland and Wolff specialises in supporting the ever-growing needs of the maritime, offshore and renewable energy sectors. Harland and Wolff’s massive Samson gantry crane lifted an incredible 774 tonne load to certify their latest spreader beam arrangement under the watchful eye of Lloyds Ireland. 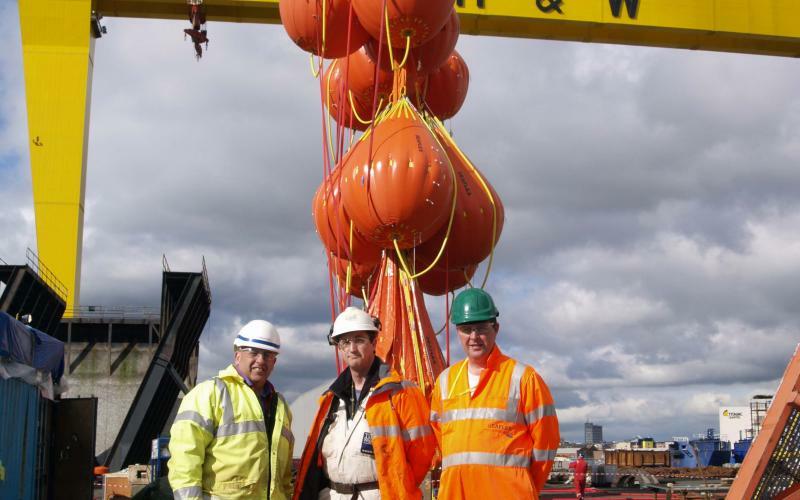 Unique Seaflex’s Site Services Manager, Ben Board attended, to assist Harland and Wolff with ensuring the most efficient and effective use of these bags and load cells throughout the operation. Construction Manager @ Harland and Wolff, Chris Matthews directed the entire operation and was delighted with the result. He said: "This is an important milestone in Harland and Wolff’s heavy lifting capability for offshore fabrication projects. The spreader beam combination is purpose designed for the lifting of jackets onto barges, but can be used in a variety of configurations for a range of heavy structures." Ben Board added: "We are delighted to have been selected by Harland and Wolff to execute this historic test. Following several weeks of discussions with the client to ensure a safe and well engineered solution, Unique Seaflex rented 24 WaterLoad™ bags of up to 50t capacity plus two 500t telemetric load cells to record the test. With the insight gained from this project, we are looking forward to repeat business with other clients as well." Available for either hire or sale worldwide via an ever-increasing global network of stockholding partners, the Unique Seaflex WaterLoad™ range is at the forefront of being able to demonstrate compliance to LEEA 051 guidelines for the use of such equipment - having proven itself capable of withstanding overloads many times in excess of its working load limits, with Type Test Certification and Product Design Assessment Certification from ABS by way of independent verification of the integrity of these designs. All of which results in market-leading peace of mind for customers who are conducting load tests on any scale up to and including this most recent record-setting test.